SugarMyBowl.com: Bring On The Blizzard! It was a perfect Sunday for us. My kids and I couldn't wait to get dumped on with snow! 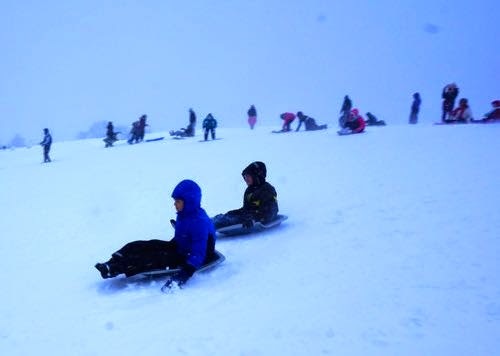 Just a few blocks from our house is a big beautiful hill that has brought in so much fun for the kids. We go there for kiting on summers and sledding on winters! As soon as we heard of a major blizzard forecast coming to the city, we started gathering our gears and even called friends to meet there. Today's snow did not disappoint (has been snowing non-stop for the last 24 hours) and to make things even more perfect for the kids - their school called off tomorrow! SNOW DAY!